Buy online TC4420 High Speed MOSFET Driver in India at low price from DNA Technology, Nashik. 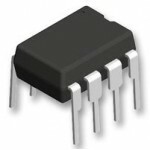 The TC4420/4429 are 6A (peak),single output MOSFET drivers. The TC4429 is an inverting driver (pin-compatible with the TC429), while the TC4420 is a non-inverting driver. These drivers are fabricated in CMOS for lower power, more efficient operation versus bipolar drivers. Both devices have TTL-compatible inputs, which can be driven as high as VDD + 0.3V or as low as – 5V without upset or damage to the device. This eliminates the need for external level shifting circuitry and its associated cost and size. The output swing is rail-to-rail ensuring better drive voltage margin, especially during power up/power down sequencing. Propagational delay time is only 55nsec (typ.) and the output rise and fall times are only 25nsec (typ.) into 2500pF across the usable power supply range. Unlike other drivers, the TC4420/4429 are virtually latch-up proof. They replace three or more discrete components saving PCB area, parts and improving overall system reliability. Short Delay Time: 55nsec Typ. Low Output Impedance: 2.5 ? IRF630 MOSFETIRF630 is a third generation N Channel Power MOSFETs that provides designer with the be..
A3120 IGBT Gate Drive OptocouplerThe HCPL-3120 consists of a GaAsP LED optically coupled to an integ..
TC4424 3A Dual High-Speed Power MOSFET DriversThe TC4423/TC4424/TC4425 devices are a family of 3A, d..
TC426 High-Speed Power MOSFET DriversThe TC426/TC427/TC428 are dual CMOS high-speed drivers. A TTL/C..
TC4428 Power MOSFET DriverThe TC4428 is improved versions of the earlier TC428 family of MOSFET driv..